My first experience with scotch was not a very pleasant one. An uncle of mine was an avid blended scotch drinker and insisted that I become one too. As an 18 year old, rum and coke was my beverage of choice; scotch was just not my thing. In every respect, I was a lightweight drinker. His last ploy was to suggest diet grape soda as a mixer. As I recall, it took quite a while to recover from this introduction to the world of scotch. Fortunately, some memories fade quickly. Some time later, my career landed me in Boston and I was able to rediscover this magic elixir. It was custom and tradition at one particular institution of higher learning to end the workweek in the Provost’s office around 4:00 PM. “Happy hour” went till 6:00 PM. Scotch was the only beverage served. It was not of the highest quality but it served its purpose. Thank goodness for higher education and New England winters. But I was forever a Virginian and had the good fortune to return. Don Creamer and I became colleagues in the mid 1980s and we have been close friends ever since. As part of our work together, we had the opportunity to visit Oxford and London some six or seven years ago. While we very much enjoyed visiting the historic pubs and sampling ales of all variety, I was immediately drawn to the single malt, for it has always been the “water of life.” Indeed, before Don and I knew it, we were cataloguing our tasting notes and tracking our preferences. Our new hobby was rapidly approaching a passion. Our first tasting notes were produced in hard copy but it became a tedious process that was difficult to share with our friends and colleagues. 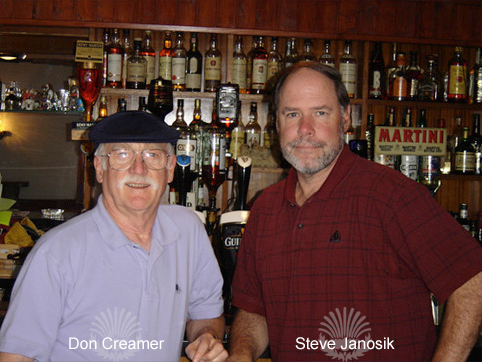 In 2001, we decided to produce and electronic version of our notes as Steve and Don’s Single Malt Scotch Journal. We are now well beyond some 300 web pages and it has become a real labor of love. Thanks to my son, David, we have transformed a rather simple web presence into something much more comprehensive and dynamic. We hope our efforts will inspire you to begin your own quest to find the perfect single malt. If you visit this web site often, you can learn and grow right along with us. My “acquired” taste for scotch came early in my life–sometime during my twenties or so. Initially, I enjoyed blended scotches and was satisfied with this choice until about 20 years ago. My early exploration of single malts resulted in tentative appreciation for the new tastes, but I was limited by what stores in Virginia carried–either some very simple scotches like Glenlivet or very peat laden scotches like Laphoraig. Neither taste at the time satisfied my interests. The new taste was enough, however, to drive me to find other single malts and to learn more about them. The more I learned, the more fascinated I became with the beautiful simplicity of how these malts are made and the amazing array of flavors that can be achieved with from barley and water. The big turning point in my appreciation of single malts came when I learned that my friend, Steve Janosik, shared my growing fascination for single malts. We began by tasting new scotches and by rating them for our own enlightenment. It was Steve’s idea to create Steve and Don’s Scotch Journal that he has maintained for several years. Soon, we began to achieve milestones–50 single malts, 75, 100, etc. We celebrated each milestone however we could, but I will always remember the celebration of our 150th tasting. It was a 16 year old cast strength Glen Grant that we purchased at the Glen Grant distillery in Scotland. We walked outside the building, found a bench, opened the bottle, and shared the elixir on a beautiful sun-drenched day. We also gave it our highest rating! Steve always has likened the two of us as hunters and gatherers of fine single malts, neglecting I always thought, that we also were happy consumers of the product. It is from these depictions, however, that the current Internet site found its name–Scotch Hunter. Indeed, we enjoy the quest every day. We always are on the lookout for new tastes as well as reminders of wonderful old tastes. Just last evening, we tasted three “old” malts–a 15 year old Linkwood, a 14 year old Aberfeldy, and a 15 year old Glenesk–and found them to be wonderful all over again. We welcome all to join us in this totally fun experience of tasting, and re-tasting, great single malt scotches.